The system comprised 8 test sockets for socketed single-pole double-throw (SPDT) relays. A set of instruments within the tester were used to perform a series of tests on the relays, however these were shared resources (i.e. dedicated instruments were not assigned to each test socket). A switch matrix was used to route signals from the UUTs to the instrumentation and dedicated control signals were used to switch the relays. In addition a visual indicator and UUT presence sensor was available for each test socket. 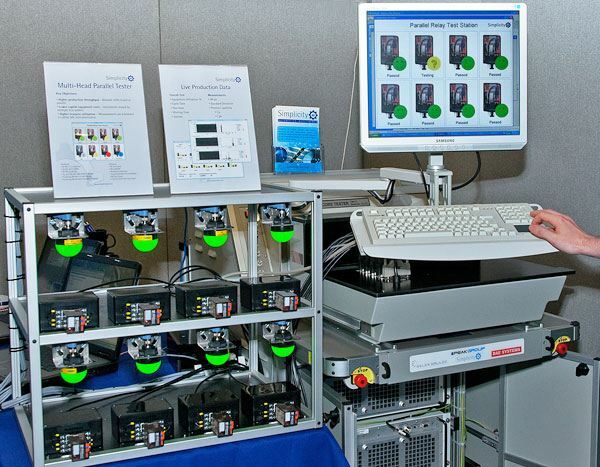 The software was written using National Instruments’ TestStand and LabVIEW. The test sequences were constructed to showcase the “Auto Schedule” functionality of TestStand allowing parallel testing of multiple UUTs and efficient sharing of resources. Effectively, the test application was able to test each relay in parallel, using a limited set of test resources, by dynamically re-ordering the test process (within constraints) to make efficient use of the instrumentation. The UUT presence sensor was able to automatically determine the insertion of a relay into an idle test socket, and start the test without any operator intervention. In addition, the removal of a relay during a test would automatically terminate the socket’s test sequence. At the completion of a relay test, a visual indicator above each test socket would indicate the status. Test results were logged for each measurement and a “Live Production Data” display was available showing overall test station utilisation and measurement statistics. While originally conceived as a technology demonstrator, the software was architected to provide a reference design for parallel testing scenarios, which could be very easily adapted to handle testing of any specific UUT. The benefits of parallel testing speak for themselves: increased throughput, lower equipment costs, higher utilisation all add up to ensure lower overall cost of ownership for production environments.